It's officially cookie season! For some reason the Christmas season is totally free reign to make mass amounts of cookies. Well I should say I take free reign to make crazy amounts of cookies. I guess I save up all my cookie mojo until December and then I just go nuts. In a given holiday cookie season I make upwards of 600-800 cookies of all shapes and sizes. Even though it seems a little crazy...I know I'm not the only one...you other crazy cookie people know who you are. Anyway, I always like to try at least one new cookie each holiday season, and this weeks French Fridays with Dorie pick seemed perfect. 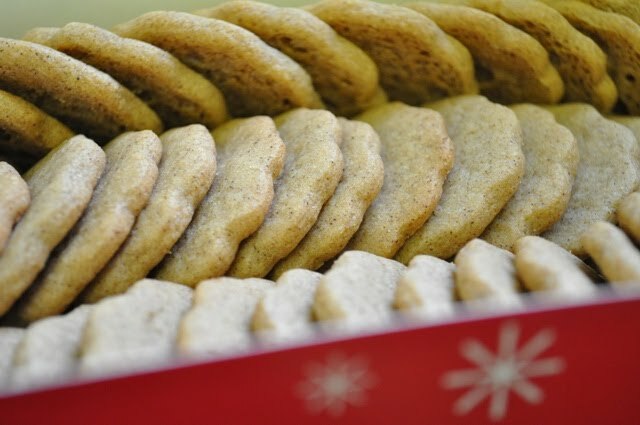 Speculoos cookies are a small crisp spice cookie that scream holiday. I'm not normally a crisp cookie girl, but for some reason I couldn't stop popping these little babies into my mouth. They were addictive. The spices were perfect...a lot of cinnamon, a little ginger and bit of clove. A perfect blend of warm spicy goodness that makes me smile. The recipe calls for you to divide the dough into discs and to roll each disc between 2 sheets of parchment paper. This is my first time rolling out dough this way and it worked beautifully. I will be trying this with other rolled cookie dough and even pie crust. Dorie is very specific that the rolled dough must be refrigerated for at least 3 hours before cutting and baking. I waited exactly 3 hours and had no issues getting the cookies cut with my 1 1/2 inch scalloped shaped cookie cutter. If you think that you should under bake these for a less crisp cookie, don't bother. They just have a stale crunch....sort of crisp but not all the way there. Accept these are crunchy cookies and bake them accordingly. But you can dress them up a bit by dipping them in dark chocolate. Dorie also recommends sandwiching them with Nutella or dulce de leche. Both would be delicious for certain. If you want the recipe check out Dorie's newest cookbook, Around My French Table. Perhaps this is going to be corrected in future publications of the book, but my version leaves the egg out of the ingredient list and instructions. So be sure to add in 1 egg to the butter sugar mixture....cause if you don't you won't have cookies....you'll have crumble...and you can't add the egg in at the end. Cause it doesn't work. Trust me. These are tasty little holiday cookies. Give them a try! Your cookies look great. I can't believe you make 600-800 cookies in December. Holy moly, I bet your friends and family love you! Your little cookies look so inviting~! I love them. I am also a crazy cookie baking person over the holidays. Actually, I have been known to go on cookie baking sprees throughout the year. Especially after I found out freezing cookies really works and still taste great de-frosted. Dipping them in chocolate! How smart. I am a crazy cookie person over the holidays and the funny things is that I give them all away! By the time I am done baking cookies, I dont have a taste for them :) These are very pretty too. I also made the speculoos this past week. Your speculoos look so good! This is one recipe I want to try from Dorie's new book soon and the idea to sandwich them with Nutella is definitely on my radar. Your Speculoos look wonderful. I love that you dipped them in chocolate. I think they will be my next pick. I'm another crazy cookie person…along with a lot of other holiday baking! WOW! Beautiful cookies and I can almost taste them. And, I enjoy late posts too. It keeps me reading about all the delicious foods I will be making this month. 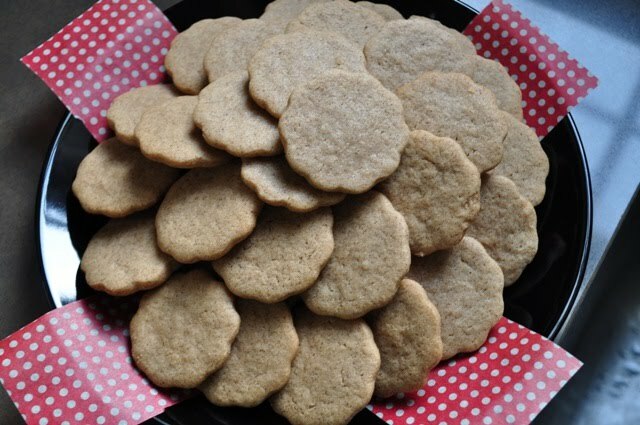 Every time I check in on Dorie's blog to see if I need to vote on something or whatever...I check to see if there are more links to view...and I keep finding a few and it keeps me excited for recipes like these cookies...yours turned out great! These look great--love love love the idea of dipping in chocolate (I sandwiched mine, but your way makes more cookies). It is fantastic that you churn out so many cookies--what a great treat for family and friends. 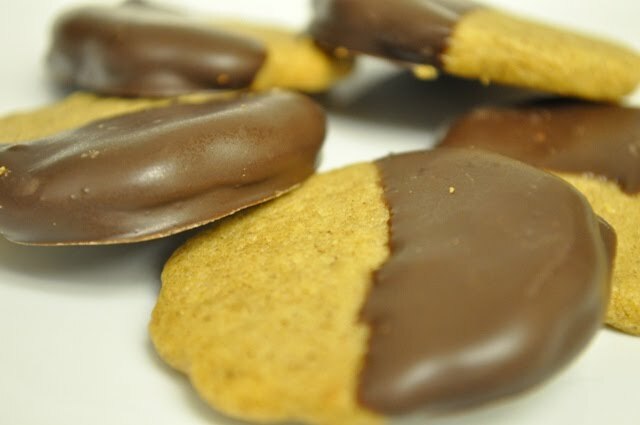 BTW, as an experienced cookie maker, do you have any tips for dipping cookies in chocolate. I hate tempering, but chocolate always looks a little weird after cooling if I don't. Are you using chocolate bark instead of real chocolate? 600-800 cookies is my idea of good crazy girl :) Especially if they all look this good.